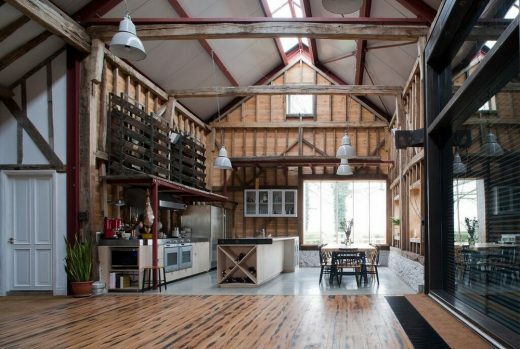 The design eschews the language of the typical barn conversion, instead making the cluster of historic agricultural buildings into an atmospheric getaway for relaxing and gathering. 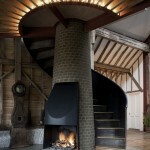 Our clients, a fashion designer & a digital designer, are avid collectors of reclaimed architectural artefacts. 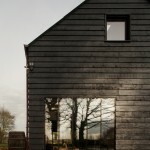 Together with the existing fabric of the barn, their discoveries form the material palette. 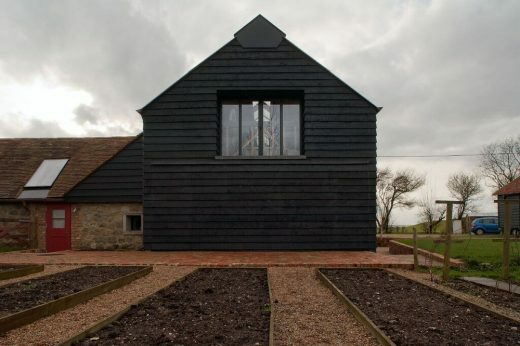 The result – part curation, part restoration – is a unique interpretation of the 18th Century threshing barn, a building type that often engenders a uniformity of approach when converted. 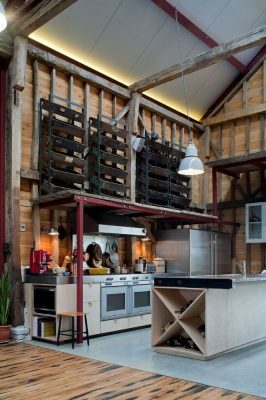 Rather than demand specific spaces or programmes, their brief focused on materiality and atmosphere, and on creative re-use of the existing volumes. 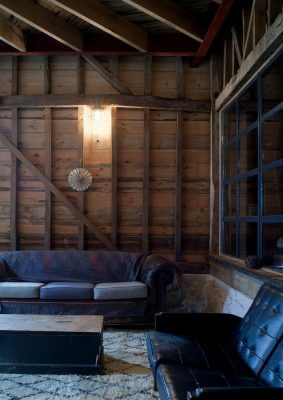 Our task was to combine the quality of the surviving barn fragments with the texture and tone of their found materials. 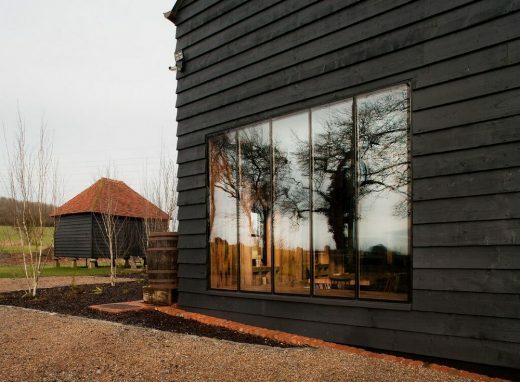 Set in an Area of Outstanding Natural Beauty, the 18th Century threshing barn, dairy and stables are a prominent feature from the North Downs Way. 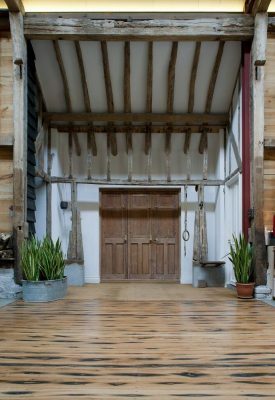 To maintain the barn’s brooding presence – and to provide security and a sense of protection from rolling Channel mists – the barn is usually kept in a closed state. 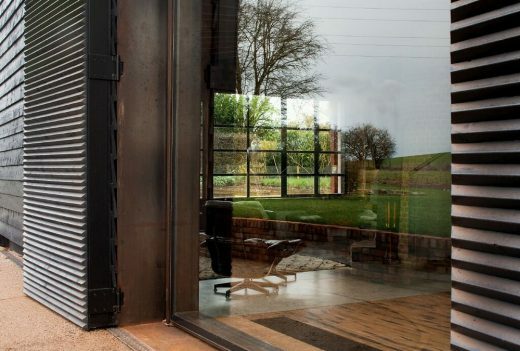 However, industrial-scale kinetic mechanisms create openings that address key views into the countryside. 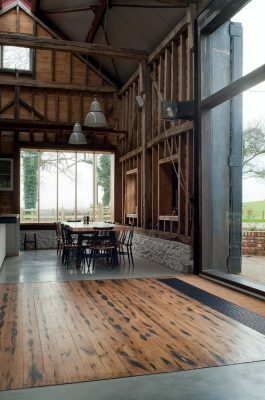 Massive, insulated shutters recall the original barn doors, and protect a vast rotating window operated by an adapted chain-lift. 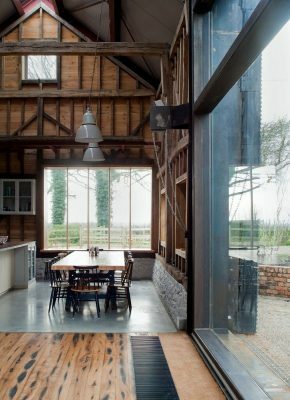 To the East front, an American aircrafthangar door allows the exterior to concertina upwards, creating a canopy over the dining terrace and revealing ribbon glazing within. 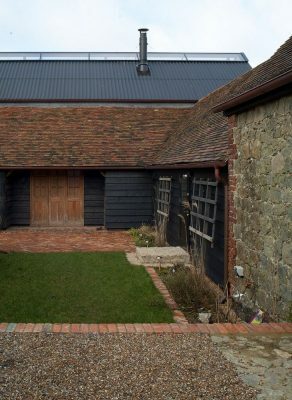 A single rooflight, running the length of the main roof’s ridge provides steady ambient light to the living spaces. 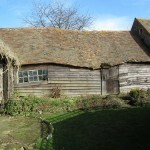 The original green oak framing was in a state of nearcollapse at the start of the project: it was carefully disassembled and removed from site for repair by the Green Oak Company, specialists in traditional handcarpentry techniques. 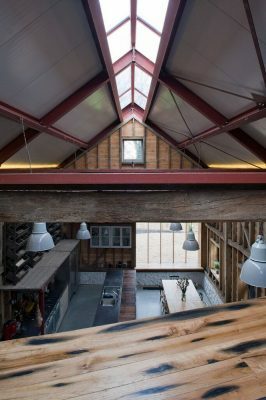 While the smaller stable range remains timber-framed, the main barn frame and cladding is largely cosmetic – the oak is supported by a steel exoskeleton clad in a super-insulated industrial SIP system. 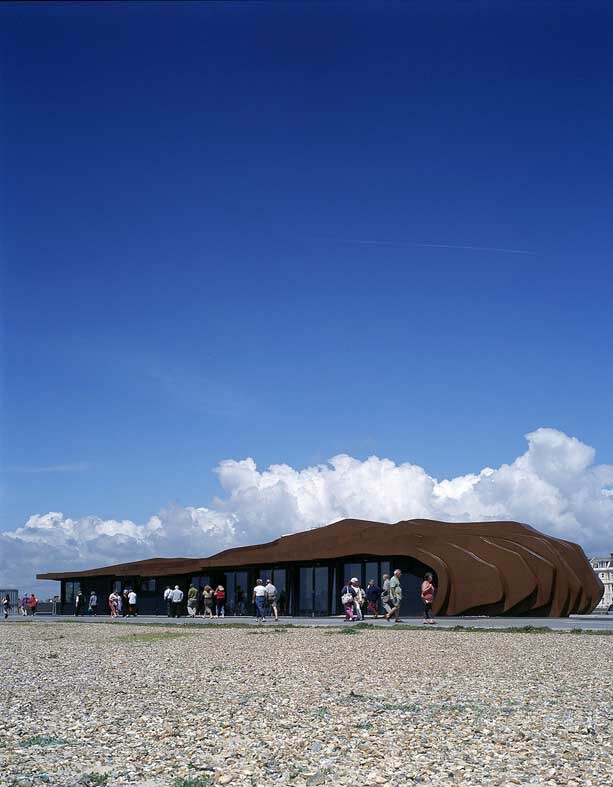 This structural approach allowed for rapid completion of the building envelope and incorporation of the huge opening mechanisms. 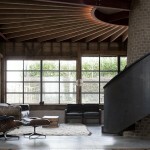 One of the central spatial challenges was insertion of a mezzanine (for sleeping and bathing) into the main volume. 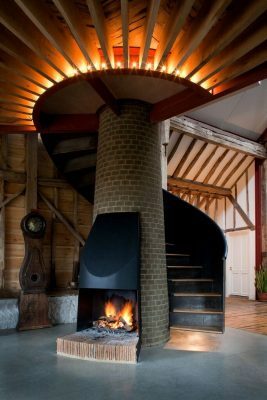 A tapering brick chimney supports the corner of the mezzanine, and incorporates a cantilevered, waxed steel staircase and an open fireplace. 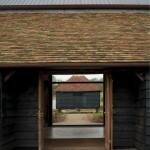 This hybrid device interrupts the regularity of the three-bayed barn and delineates the different programmes within. 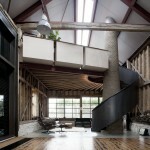 The prevalence of recycled and found materials belie hightech solutions to the building’s operational requirements. 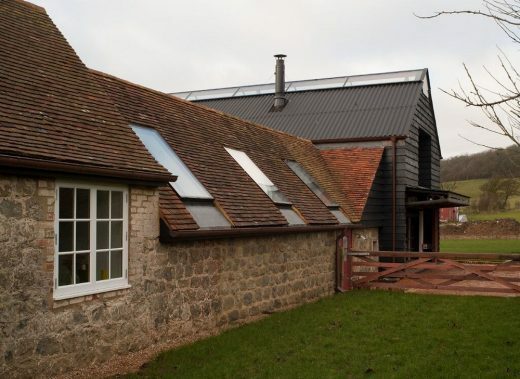 A ground-source heat pump harvests warmth from the paddock soil to provide heating & hot water. 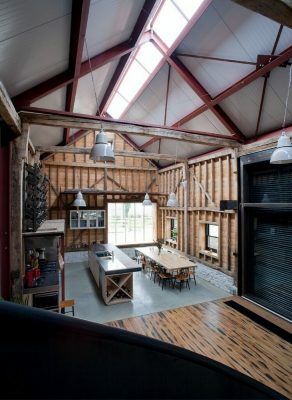 Reclaimed light fittings were adapted to use long-life, low-energy LED lamps. 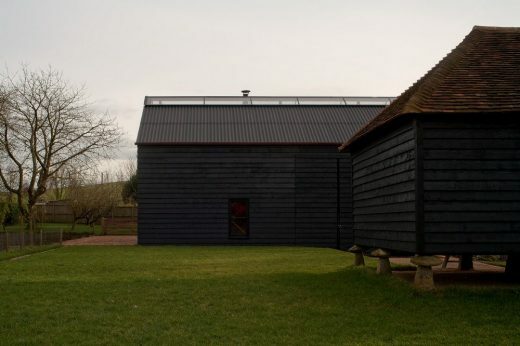 Integration of heat, light and security systems allow Sinclair (who travels frequently between his studios in London, New York and Malmo) to manage the building and work remotely – the barn is part of the nascent Internet of Things. 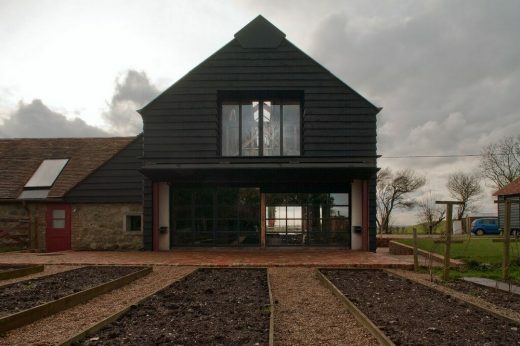 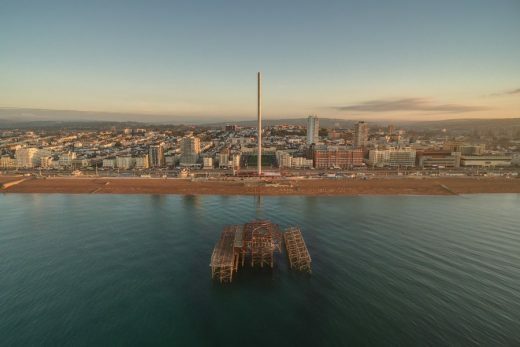 Work commenced on site in September 2012 and completed December 2014.